Here's looking at you Alaska! There are plenty of blogs, articles, and words written about Alaska. As a result of that I was preparing to write this post for the Hashtag 59 community I was thinking about what I wanted to share with you. The word is Wild. Alaska is a wild...and awesome...and beautiful place. Don't be prepared for anything but a wild adventure. You'd be doing yourself a disservice if you didn't assume. This is of course assuming you aren't just going up there to go on a cruise. I have nothing against people who go on cruises; just don't let that be your only Alaska experience. There's too much to see, too many people to connect with, and a multitude of experiences to be had in this state. I'll now share some of my favorite stories that made this trip to Alaska so wild! Exit Glacier Hiking in Kenai Fjords National Park. The hiking is wild. The hiking isn't just your normal day hike fun. You get to carry bear spray pretty much anywhere you go, if there is a trail you are lucky because most of Alaska is actually just backcountry, and there are more than enough "adventure hiking" options like the pic above on a glacier to keep you from getting bored on another "lake loop day hike". 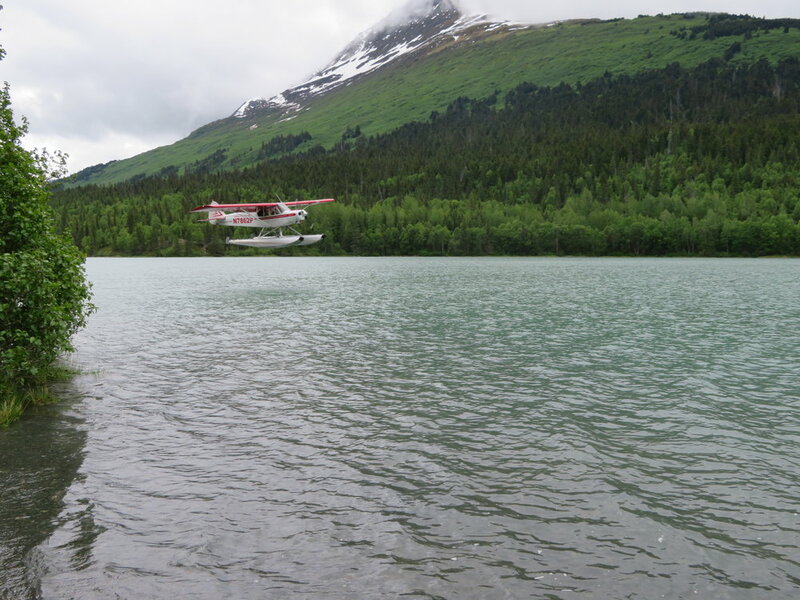 Bush plane landing on a lake near Chugach National Forest. The transportation is wild. The best mode to get around to see a lot of the areas is bush plane. In fact if you want to visit all 59 of the US National Parks (where we get our name Hashtag 59 from) you'll be looking at a bush plane ride to at least 4 of the 8 parks in Alaska. Well of course you could just bushwhack over 20 miles from the nearest road to reach the entrance to Gates of the Arctic National Park. Which then leads into the backcountry but most take a plane ride to get there or they just fly over it. And if you want to summit Mount McKinley...yep you guessed it...you get to start your hike with a plane landing at 7,000 feet on top of a glacier. A nice little way to get your nerves spiked prior to a technical summit climb to the highest point in North America! The race, as you can see in the pic above, throws in 8 miles of trail running. Which is highly unusual for a marathon city race...but it's Alaska...so even the running is wild! You are also instructed on what to do if you see a bear or a moose during the race, that's wild! The wildlife is wild! That goes without saying. I saw 5 Grizzly Bears, 1 Black Bear, dozens of moose, and enough caribou to last a lifetime. It was pretty amazing. The Denali National Park Bus Tour is the best way to spot the most and wildest of wildlife. The activism is wild. They love what they stand for. They like their guns and hate their plastics. I'm aligned with one of the two; you guess or can assume which one :). Either way, as you can see from this sign in the Alaska Wildlife Center in Seward, they get wild about what they believe in! The weather is wild. It rained for three straight days in mid-June and due to being there during the summer solstice we didn't see darkness for 10 days! It wasn't until our red eye flight home that I saw a sky that wasn't completely bright. Alaskan Huksy Pup...3 weeks old. Even their most famous race is wild! No offense to a marathon or climbing a mountain but the Iditarod is one of the craziest races in the entire world. They like to call it "The Last Great Race on Earth." Visiting the museum and reading more about the race only cemented my thoughts on that. I could go on for days about Alaska. My only advice is to go. And then go back again. And again. And again! I hope by sharing some stories about the wildness of Alaska you will be excited and ready to plan your trip. Comment below with questions on thoughts on your Alaskan journey. Keep in tune on our FB page and sign up for our newsletter; we have tons of events and contests going on and want you to get the full "59'er" experience!